Started the day in Wichita (Ks) and targeted the Slight Risk down in SW Oklahoma - On the way south we intercepted a Nice Sculptured LP (Low Precip) Supercell near to Clinton. This was very nice to look at but as it left the dryline it just fizzled to nothing so we needed the better juice further South West and headed of towards Altus where a HP Supercell was stationery and dumping 2" Hailstones. 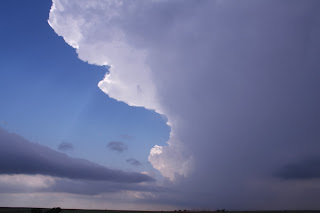 It became apparent that no Tornadoes would be on offer this day but fab structure and so we followed this Storm South Eastwards down Highway 287 towards Wichita Falls. Thats where we ended the day after taking some Lightning photos.